1. Good carving starts with the right pumpkin. Choose one that is fresh with a rugged stem and no bruising that has a flat bottom. These are best so they won't roll. 2. Cut out the lid � a boning knife works best. Cut on an angle, not straight up and down like most people think. This makes it so the lid won't drop inside the pumpkin when you replace it. Remove the pulp with a special pumpkin scoop or an ice cream scoop will work too. 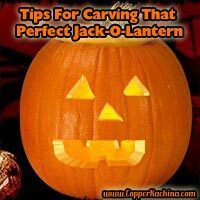 Thin the inner wall of the face side of the jack-o-lantern area to 1 1/4-inch thick, so it will be easier to pierce the shell. 3. Put the pumpkin in a bucket or tub of cold water. Putting a little unscented Clorox bleach in the water will prevent your pumpkin from prematurely molding by killing off nasty pumpkin fungus. 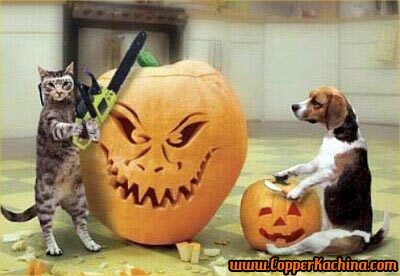 (If the pumpkin is carved, put the carved part face down). Let the pumpkin float, and let the insides fill with water. The pumpkin will absorb the water and become very firm. If you have fine detail work to do, you may want to let your pumpkin soak over night. 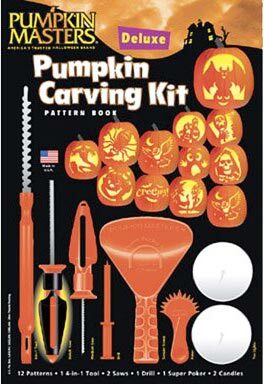 This will firm up the pumpkin flesh and allow you to do intricate carving. 5. Keep your pumpkin fresh. Spread petroleum jelly on the exposed, sawed edges to seal in moisture. If your pumpkin still shrivels a few days later, revive it with a facedown soak in cold water for up to eight hours. Once you remove a wet pumpkin for display, you should immediately dry it off. This prevents mold from having a chance to grow. 6. If you like to leave the lid on while the candle is lit, create a chimney. First, leave the lid on for a few minutes while the candle burns, then make a small hole where the lid has blackened. 7. Sprinkle a little cinnamon inside the lid. When you light the candle, your Jack-O'-Lantern will smell like a pumpkin pie. 8. Here's the tricky part. Everyone loves to take pictures of their Jack-O-Lanterns. To get the pictures to come out right, try this. With the pumpkin lit, ideally in a mostly darkened room, take a picture of the pumpkin without using a flash. For really good shots, mount the camera on a tripod and use a zoom lens. This will change the focal distance, blurring the background, but keeping the pumpkin sharp. Also, try to let the shutter stay open longer. Good luck and have a safe and Happy Halloween!